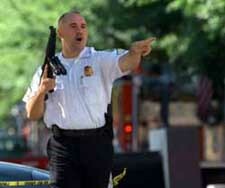 At the time of September 11, 2001, I was living in Alexandria, VA, near the Braddock Road Metro Station. My job was Project Manager for the National Association of Private Special Education Centers, which is located three blocks from the White House. 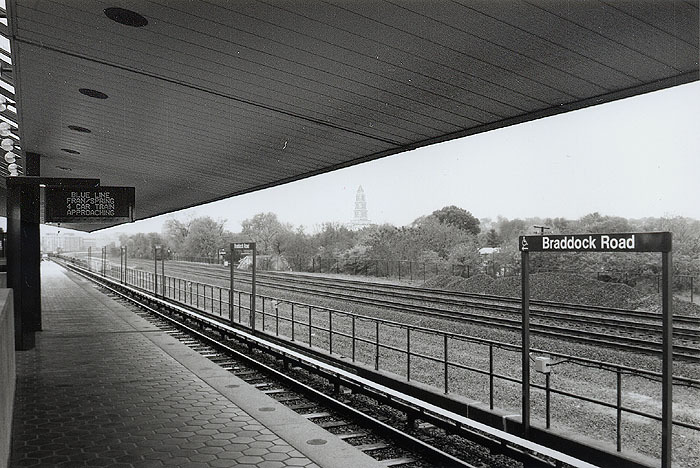 Each work day, I would park near the Braddock Road Station, walk to the station and take the train to the McPherson Square Station. From there, I would walk two blocks to work. At that time, I did not carry my cell phone with me, and instead would leave it in my car during the day. After that day, I would keep it with me at all times. Below is a timeline of where I was and what I did on September 11, 2001. Italicized times are my approximate times, as I do not wear a watch and I did not have my cell phone with me then. All other times are taken from the timeline established by the Center for Cooperative Research. 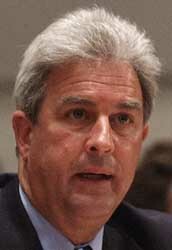 8:13 a.m. American Airlines Flight 11 is hijacked. It will turn toward New York City. 8:42 a.m. United Airlines Flight 175 is hijacked. It will turn toward New York City. 8:45 a.m. I am just now getting on the train that will take me to work. I will remain unaware of these hijackings and the World Trade Center attacks until after I get to the office around 9:30. 8:46 a.m. 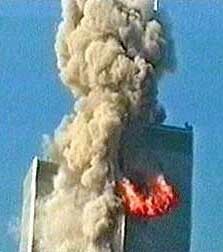 Flight 11 hits the North Tower of the World Trade Center. 8:48 a.m. CNN first major network to show World Trade Center crash footage. 8:50 a.m. American Airlines Flight 77 is hijacked. It will turn toward Washington, DC. 9:03 a.m. Flight 175 crashes into the South Tower of the World Trade Center; millions watch live on television. 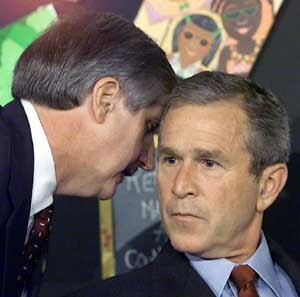 9:06 a.m. At a photo-op in a classroom at Booker Elementary School in Sarasota, FL, Chief of Staff Andrew Card whispers to President George Bush that the World Trade Center has been hit again and, "America's under attack." 9:17 a.m. Federal Aviation Administration (FAA) shuts down all New York City airports. 9:21 a.m. All New York City bridges and tunnels are closed. 9:26 a.m. FAA Administrator Jane Garvey bans all take-offs nationwide. 9:28 a.m. United Airlines Flight 93 is hijacked. It will turn toward Washington, DC. 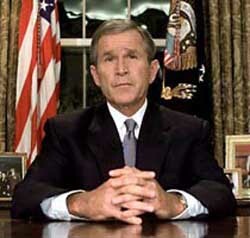 9:29 a.m. President Bush gives a speech from the school, proclaiming a terrorist attack on the United States. 9:32 a.m. The New York Stock Exchange closes. 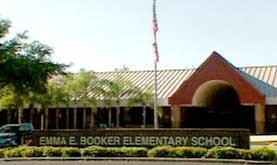 9:34 a.m. President Bush leaves Booker Elementary School for the Sarasota Airport. 9:35 a.m. I enter the NAPSEC offices and find my colleagues watching the CNN coverage of the World Trade Center attacks. On this date, I have a family member who works on Capitol Hill who I'll call Tina. I phone her to make sure she's okay and find out if she has any news. As far as we know at the moment, this is happening in New York City and there seems to be no direct threat to us, so we hang up a couple minutes later. 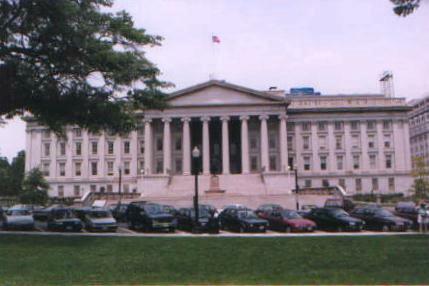 9:35 a.m. Treasury Department evacuates. 9:37 a.m. 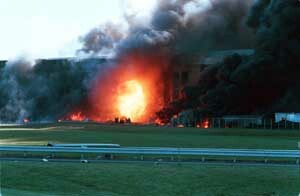 Flight 77 crashes into the Pentagon. 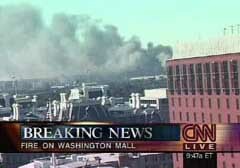 9:39 a.m. NBC News reports Pentagon explosion. 9:40-9:45 a.m. Another NAPSEC colleague, running late that morning, phones our offices in hysterics. 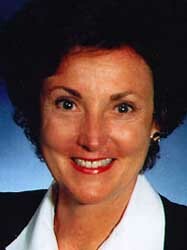 She lived then in Arlington, VA, and has just seen or heard Flight 77 hit the Pentagon outside her apartment. My boss, thinking she is en route, shouts, "Gina, go home!" The line goes dead. My boss reports this conversation to us. 9:45 a.m. White House evacuated. 9:45 a.m. FAA National Operations Manager Ben Sliney orders the entire nationwide air traffic system shut down. 9:45-9:50 a.m. I try several times to phone Tina but she does not pick up, nor do I get her voicemail. Although I do not know it at the time, our outgoing phone lines are down, although we can still accept incoming calls. In any case, after Flight 77 hits the Pentagon, Tina's office begins to evacuate and she will be driven home by a friend. I will not find out she is safe until about 11:30 a.m.
9:48 a.m. Capitol Building evacuates. 9:49 a.m. Pittsburgh flight control tower evacuates. 9:50-9:55 a.m. Numerous false reports begin airing of terrorist attacks in Washington, DC, including that of a fire on the Mall and a car bomb outside the State Department. Upon hearing these reports, I conclude that Washington is under attack and I must get to Capitol Hill to find Tina. I am unaware the Capitol area has begun evacuations. I tell my colleagues not to expect me back the rest of the day (in any case, the office closes shortly thereafter). Walking swiftly to the Metro station, I am struck by how few pedestrians and cars appear on the streets. 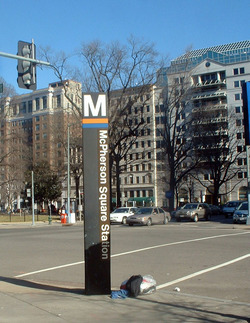 Once on the station platform, I take the first train that comes heading east to the Capitol South Metro Station. This trip will take about 15 minutes. 9:54-9:58 a.m. Flight 93 passes overhead near my hometown outside Pittsburgh, PA.
9:56 a.m. Air Force One departs the Sarasota Airport. 9:57 a.m. 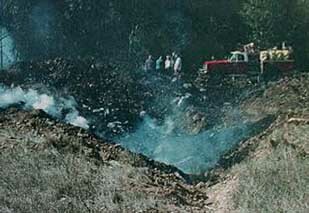 Flight 93 passengers begin attempt to regain control of the plane. 9:59 a.m. South Tower of the World Trade Center collapses. 10:00 a.m. A family member calls the NAPSEC office, trying to reach me. During the conversation, he gets the impression that I am in my car, trying to get to Tina, although my car is parked on a street in Alexandria and I am using the Metro subway system to move from place to place. 10:06 a.m. 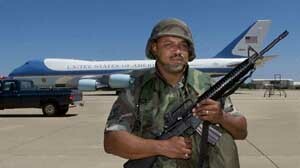 Flight 93 crashes into the Pennsylvania countryside near Somerset, PA.
10:08 a.m. Armed guards deploy around the White House. 10:10-10:20 a.m. 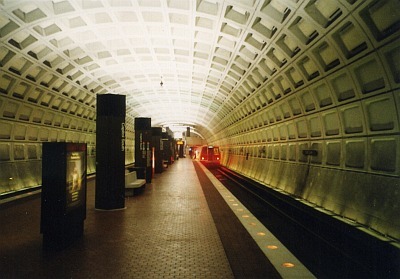 I arrive at the Capitol South Metro Station, proceed up the escalators and begin walking briskly toward the Capitol office building where Tina worked. I am almost certain that I am the only person actually navigating my way toward buildings, as hundreds of people are walking past me as part of the Capitol evacuation. As I walk, there is a loud boom in the direction of the Pentagon and I can see the black smoke in the sky. 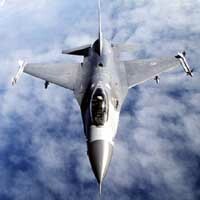 I believe the boom I heard was an F-16 fighter jet overhead. A few minutes later, just outside Tina's building, I run into a group of cafeteria workers. I ask, "Has (this building) been evacuated?" One of them replies, "All of the buildings have been evacuated." Realizing I can not find Tina in this crowd (who is blocks away in a car at this time anyway), my next objective becomes to take the Metro back to the Braddock Road Station, and walk to my car and cell phone, so I can phone family and let them know I'm okay. I return to the Capitol South Station and get on an Orange Line train heading west. 10:13 a.m. The United Nations building in New York City evacuates. Other prominent federal buildings in Washington, DC, also begin evacuations around this time. 10:20-10:40 a.m. 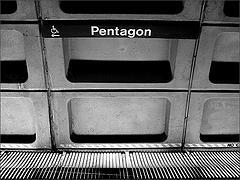 I take the next Metro train heading west so I can go to the L'Enfant Metro Station. While en route, a passenger displays gallows humor by commenting that he's "heading to Anacostia where it's safe." Arriving at the L'Enfant Plaza Station, I plan to transfer to a Yellow Line train that should take me more directly and quickly into Alexandria. However, unbeknownst to anyone, Metro has initiated a 15-minute stop on all trains, so after waiting a few minutes, I give up and go back to the Orange & Blue Line track heading west. An Orange Line train arrives shortly thereafter. Even though I need a Blue Line train to get me to Alexandria, I decide to take this train so I can travel at least as far as the Rosslyn station in Virginia and then wait for a Blue Line train there. 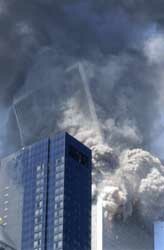 10:28 a.m. North Tower of the World Trade Center collapses. 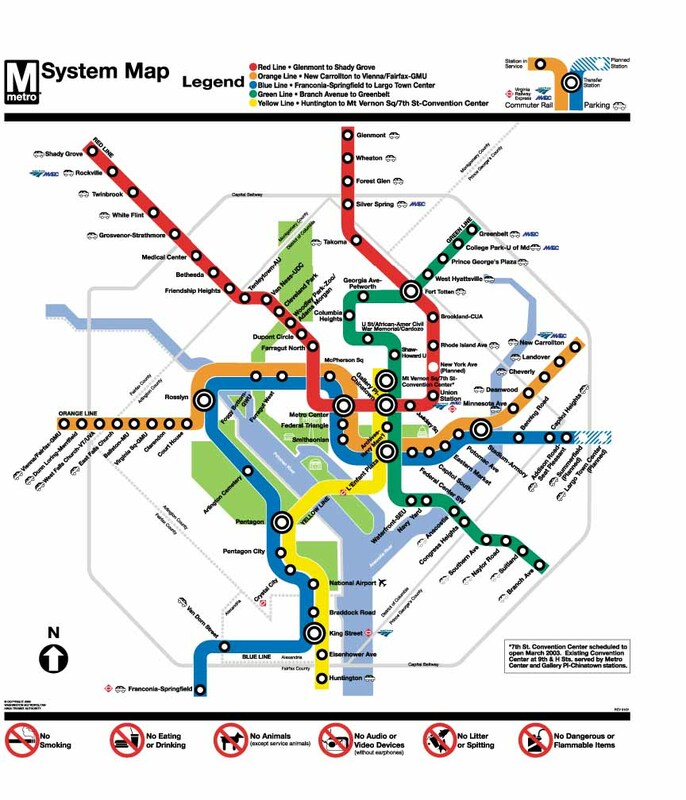 10:40-11:30 a.m. After boarding the Orange Line train, the conductor announces that train service on the Blue Line from Rosslyn has been suspended. I stay on the train, since if I can get off at Rosslyn, at least I'll be in Virginia. A few minutes later, he announces that my Orange Line train is now a Blue Line train, and that we will continue into Alexandria--a lucky break--but that the Pentagon Station is closed. Along the way, I hear from another passenger that both World Trade Center towers have collapsed. I remember thinking, I hope that's not true. 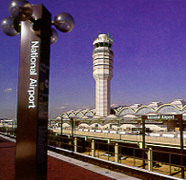 As we near the Washington National Airport Station, the conductor announces that station also is closed. After I disembark at the Braddock Road Station, I walk to my car. 11 a.m. Major skyscrapers and tourist attractions begin to close, including Walt Disney World, Philadelphia's Liberty Bell and Independence Hall, the Space Needle and the Gateway Arch. 11:30-11:50 a.m. After I arrive at my car, I see about 8 messages indicated for my voicemail. Ignoring those for the moment, I begin making phone calls to family. After about six tries, I am able to speak to Tina, who is still in the car heading home. I then proceed to call other family members to assure them I'm okay. Then I check my voicemails and drive home, watching the news coverage of the attacks the rest of the day. It is only after noon when I first see the footage of the planes hitting the tower and their collapse. 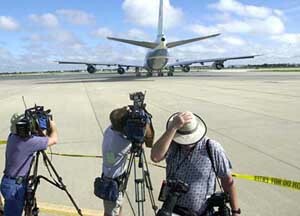 11:45 a.m. Air Force One lands at Louisiana Air Force base. 12:16 p.m. U.S. airspace cleared of all civilian aircraft. 12:36 p.m. President Bush records a second speech, which is aired about 30 minutes later. 1:02 p.m. New York City Mayor Rudy Giuliani orders an evacuation of Southern Manhattan. 1:30 p.m. Air Force One leaves Louisiana for Nebraska. 2:50 p.m. Air Force One lands at Offutt Air Force Base near Omaha, NE. 4:33 p.m. Air Force One leaves Nebraska for Washington, DC. 6:54 p.m. President Bush returns to the White House. 8:30 p.m. President Bush delivers his third speech to the nation and declares the Bush Doctrine: "We will make no distinction between the terrorists who committed these acts and those who harbor them." Postscript After I was unable to reach Tina and saw coverage of fires and bombings in Washington, DC, my first instinct was simple: find Tina and make sure she's safe. I remember thinking, if something happens to her building, I want to be there to do something to help.